New login page coming soon! This summer we began consolidating all of our various public-facing web platforms, so that our blog, website, and store are all integrated into one website. Well, our task is almost complete. Shortly, we will push our new login page live. Designed to load quickly even with limited internet bandwidth, it’s clean, simple, and functional even on mobile devices. We also designed it to work when accessed through third-party applications like Filamente, which allows fast offline access to your SharePoint/Spaces sites on your iPhone or iPad. 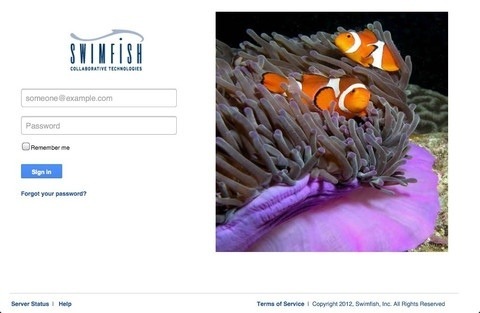 So don’t be afraid when you see the new page the next time you log into Swimfish. And let us know your thoughts on the new design! This entry was posted in Swimfish On Demand. Bookmark the permalink.